A few days in Arisaig and an opportunity to use our kayaks to explore the surrounding area and the wonderful coastline. With paddling trips to the Arisaig skerries, to Koydart and taking some time to chill and to enjoy time together, this was quality time. Making use of capable boats, great weather and the urge to explore, we toured the area and found our way into some beatiful nooks and crannies along the coastline. Two classic days are portrayed below; the first being a paddle from Mallaig to Knoydart and the second being a wonderful explore of the Arisaig skerries. A trip to the west coast would not be complete without a good day of wind and stormy conditions and, true to form, we experienced a day that didn't allow us out on the water. However, the light and the sky were just too good to miss and the photos below conclude with a number of evocative images. One of the highlights of the week was a paddle out to Inverie on Knoydart. We had a weather window and decided that it would be worth trying. 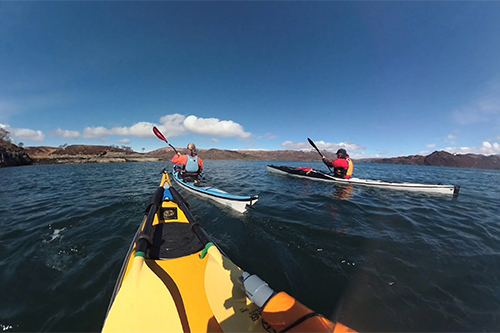 Launching from Mallaig harbour, we paddled around the coast and into Loch Nevis. Exploring the bays along the way, we hugged the coast and made our way along to the crossing point at the narrows of the loch. With the tide carrying us along, the crossing took around 15 minutes and soon we were into Inverie Bay. With calm conditions and a following tide, the paddle along the coast gave us great views into Knoydart. Soon we found ourselves approching Inverie with the very distinctive view of Sgurr Coire Choinnichean rising above the village. Having been to Knoydart many times, and by many different means, and having guided extensively on the mountains of this wild and remote area, this was the first time I had paddled in to the village - another new experience!! Drawing our kayaks up onto the shore, we relaxed for a while and had a bite to eat. The planning had been spot on as the tide was now turning and we knew that this was going to take us all the way back to Mallaig, albeit against a very slight headwind. The day was good, the views were long and as we pushed off again, we decided to take the straight line across the bay, into the loch and towards the southern shore. With the weather clearing all the while, the views to Skye and the distant Cuillin Hills opened up to us as we made our way back. As we approached Mallaig, the sea was calm, the winds were light, the air clear, the views fantastic and the company wonderful!! What could be better? Views to Eigg and to Rum opened out to us as we approached Mallaig. And with a last poke around the coastline, we were soon back around the corner and into the slip at Mallaig. Plotting our course from the downloaded GPS tracks on our return showed that we had paddled some 22km in just under 5hrs 25 mins. We didn't set out to do the trip in any particular time but we definitely had the advantage of the tide with us, both on the outward and the return leg. As can be seen from the photographs, the sea was calm and we were lucky to have a great day to enjoy the trip. 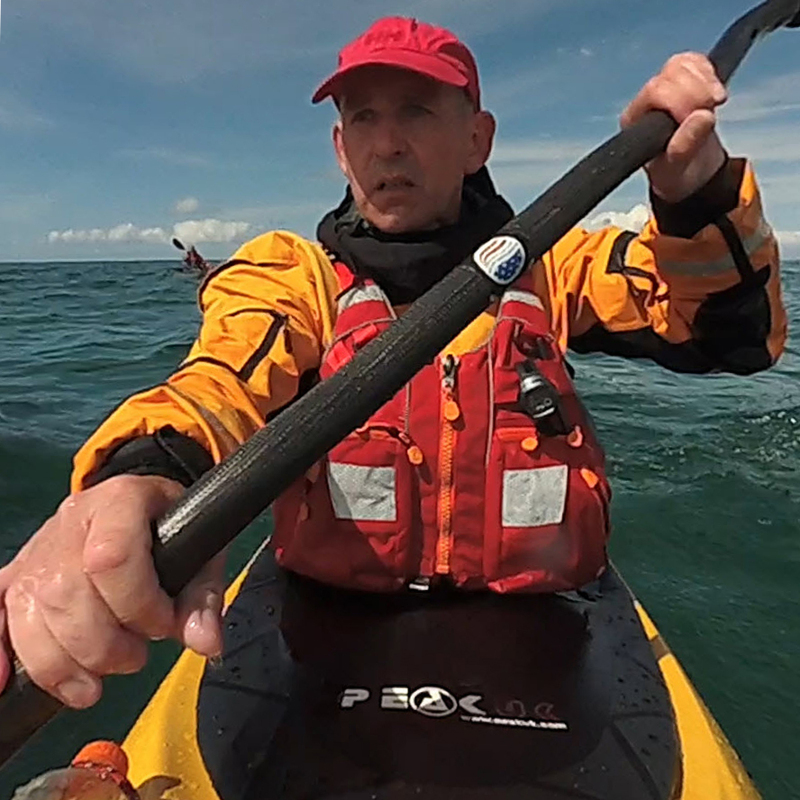 With a low tide as we set off to explore the skerries, we decided to port the kayaks across a short stretch which we knew would be flooded on the way back. Moving the boats one by one through the channel at Gortenachullish took a while. But we were soon out at the other side and an opportunity to explore the skerries. Nosing out way through the rocks and skerries on the flood tide gave us some spectacular views and perspectives. And as we made our way through the channels, the day became brighter, warmer and sunnier..
Getting close up to skerries. We had seals for company whilst exploring the coral beaches. ...and time for a swim. And all too soon it was time to head back with the tide to the campsite. Our route for the day as plotted by the GPS shows a very leisurely wander through the skerries on our last paddling day of the trip. On Scotland's west coast, rain or wind are never far away and we were treated to a day of wind at the end of the trip. The low cloud, the burnished sun on the sea and the silhouettes of Eigg made for dramatic photography. Whilst the local boats strained at their moorings against a backdrop of an inky sky. Our last night and a classic Arisaig sunset at the end of the trip. A rare study of me looking contemplative and Tania, pictured against the setting sun.